There are many nuances involved in tipping in hotels around the world. Customs may vary by country and culture. Traditional practices differ so widely that one that is favored in one country may be downright insulting in another nation. However, there are more or less widely accepted standards or at least commonly done practices in many hotels. These are especially true for international chain hotels. Following are the commonly accepted gratuity amounts and practices in hotels, divided by personnel. Here is the most common amount of gratuity given to hotel staff. Note that these are only average or standard amounts, and the country you are visiting may have different standards. Housekeeping - Tip $2 to $5 per night. Some would tell you to tip one lump sum to cover your entire stay before or after you check out. However, we think it is best that you tip per night because hotels typically rotate their housekeeping staff, so there is a chance that your tip goes to the wrong person. Bellhop - Give $1 to $2 for each bag. Add more if your bags are heavier than common. Never even think about borrowing the bellhop’s cart so you can wheel your own bags to your room without paying a tip. That is a very cheapskate move. Moreover, tip the bellhop if you request them to store your bags while your room is not yet ready. Doorman - In many places, it is okay to just thank the doorman. However, if you feel compelled to tip, give $1 to $4 if they hail you a cab or help you with your bags. Concierge - Concierges are typically tipped only when they fulfill big requests, such as securing hard-to-book tickets or dinner reservations. Shuttle driver - On average, shuttle drivers are tipped around $2. Valet - Tip your valet, especially during bad weather. The generally given amount ranges from $2 to $5. Coat check - Give the coat room attendant $1 to $2 per coat. Room service - Sometimes, hotels already include the room service charge in your bill. You do not need to tip in that case. Otherwise, do give 15% to 20% of the bill as tip for room service. Always tip, except when explicitly told not to tip or whenever you are in an area where tipping is considered rude, such as Japan. 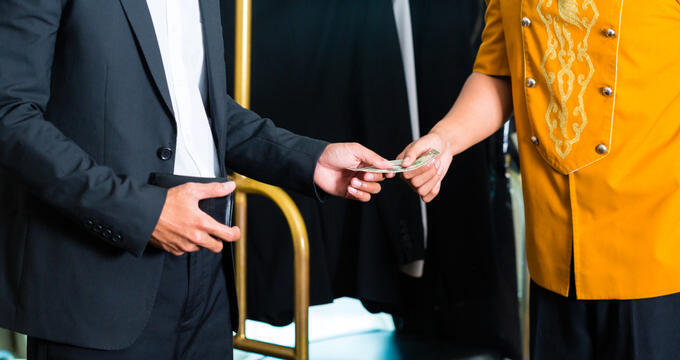 Sure, not all hotels and inns look like they deserve to be tipped and you may not always be happy with the service, but tipping is considered common courtesy in most countries around the world. Never make it appear that you dislike tipping, no matter how much you actually despise it. While it is true that it should not have become what it is today (an unspoken requirement in most areas), it is still advantageous in that it pulls service standards up. Tip in cash whenever possible. In many establishments, tips from credit cards do not actually go to the staff who served you but to the establishment’s owners. If you run out of cash for tips, the front desk may be able to help you with change. Always have some tip money in local currency ready in your purse or pocket. Tipping in foreign currency may require your server to have your money converted, for which many banks charge fees. On the one hand, it is okay to tip small when you are not satisfied with the service. On the other hand, no matter how pleased you are, never tip beyond the highest standard amount for a given sector in a specific country. It can be seen as uncouth, ignorant, or simply foolish. Be discreet and classy when tipping. There are some cultures where tips are just slipped into the hands of the staff or indicated through spoken euphemisms. Follow these practices so as not to look crass. You can still pay gratuity even after you leave a hotel and/or forget the name of the people you forgot to tip. Simply call the hotel and ask for the concierge. They will most likely know who was on shift during your stay. Tipping is now considered basic courtesy or decency in many countries. Moreover, by tipping, you are supplementing people’s income and helping them earn sufficiently to maintain a decent lifestyle. However, note that there are still some cultures where tipping is considered offensive. Before traveling to any country, read up on their stand regarding tipping to avoid awkward situations.